Listen below to “Suburban Crisis, Suburban Regeneration” : a roundtable discussion at the biennial meetings of the Society for City and Regional Planning History (SACRPH), which took place in Los Angeles on November 7, 2015. ICW is proud to announce Heavy Ground, the newest book in our Western Histories series published by UC Press and Huntington Library Press, available December 2015. Heavy Ground gives a detailed account and analysis of the March 12, 1928 collapse of the St. Francis Dam – located in the northernmost reaches of Los Angeles County – which has been called the greatest civil engineering disaster in twentieth-century American history. We interviewed co-author Donald C. Jackson, the Cornelia F. Hugel Professor of History at Lafayette College in Pennsylvania about the book, the research involved, and the impact of this disaster both then and now. How did you first become interested in the St. Francis Dam disaster, and how did you come to collaborate with Professor Hundley? DC Jackson: It doesn’t take long for someone seriously interested in the history of California dam-building to come across references to the St. Francis Dam disaster and that was certainly the case for me when I began researching the history of multiple arch dams way back in the 1970s. What struck me early on—and is an issue addressed in Heavy Ground—is the seeming incongruity of how the failure of a concrete gravity dam (i.e. St. Francis) did not spur serious concern about the viability of concrete gravity technology, but in fact precipitated the end of multiple arch dam technology in post-1928 California. 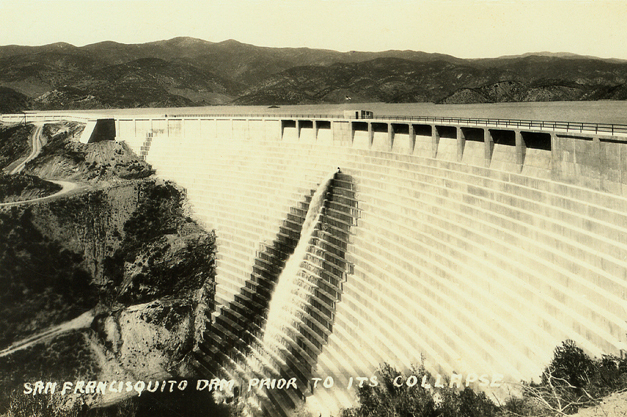 The issue was raised in my book Building the Ultimate Dam: John S. Eastwood and the Control of Water in the American West (1995), but Heavy Ground offered an opportunity to examine more carefully how some key engineering investigations of the St. Francis Dam disaster were oriented towards protecting gravity dam technology and making sure that the failure was not used to attack the proposed Boulder Dam then being considering for approval by Congress. Norris and I began our collaboration around 2001 when we were asked for some advice regarding a film documentary. Through this, we realized that we shared a perspective on the disaster (and on William Mulholland) and this led to our writing the article “Privilege and Responsibility: William Mulholland and the St. Francis Dam Disaster” published in California History in November 2004. After the article appeared we said, “Hey, let’s build upon our already extensive research and write a more wide-ranging book on the disaster,” and we plunged into project. Additional archival work was carried out in 2005-06 and the drafting of chapters began soon thereafter. But professional demands and health issues then slowed work on the project. After a hiatus, in the summer of 2012 I received a Trent R. Dames Fellowship in Civil Engineering History at the Huntington Library and work on the manuscript accelerated. Unfortunately, Norris died in April 2013 after a sustained period of declining health. However, his passing came after much work on Heavy Ground had been done and, although I was responsible for completing the book and preparing it for publication, Heavy Ground stands as a true collaboration. In my view, much of the book’s value derives from how it melds the work of two historians who, in sharing a deep interest in the history of water in the American West, each brought a distinctive perspective to studying the history of the St. Francis Dam. Why was the dam built in this particular place and time? What does “Heavy Ground” reference? DCJ: The dam was built as a component of the Los Angeles Aqueduct that brought water from the Owens Valley to the City of Los Angeles. Financing for the original construction of the aqueduct, which came to completion in 1913, was limited and did not allow for the construction of major storage reservoirs. 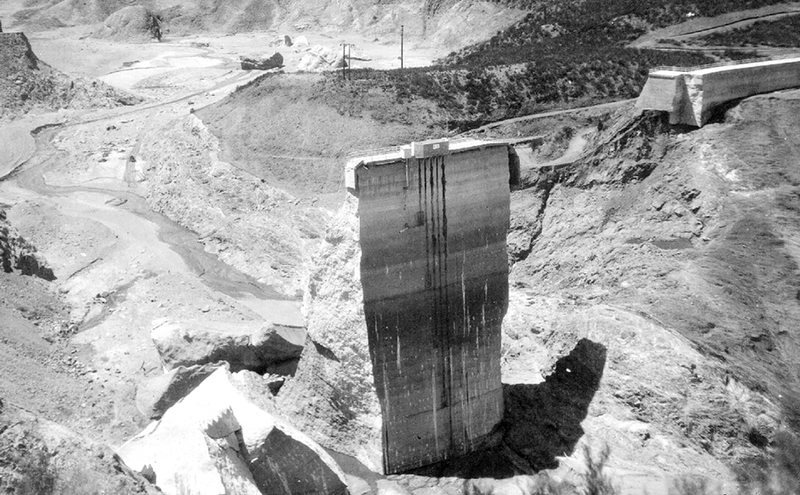 By the early 1920s the issue of storage loomed large, especially because Mulholland had encountered problems with his hope of building the Long Valley Dam in the upper Owens River watershed. Early plans for the aqueduct never mentioned the possibility of building a large dam in San Francisquito Canyon, but in 1922 Mulholland decided to pursue this option even though it acted to reduce the hydroelectric generation capacity of the city’s San Francisquito Power House No. 2. The “heavy ground” described by Lippincott is one and the same the broken schist that proved vulnerable to “uplift” when the reservoir was filled. And because Mulholland’s concrete gravity design did little to address the problems posed by “uplift” (in contrast to other major concrete dams built in the teens and 1920s), it was highly susceptible to the hydrostatic forces that brought about the collapse of the St. Francis Dam. Norris and I agreed that Lippincott’s phrase “heavy ground” spoke directly to the essential cause of the dam failure and also that it evocatively conveyed the somber, tragic character of a disaster that killed some 400 people. What impact did the disaster have on William Mulholland’s career, and do you think he should he be held accountable? DCJ: The disaster brought Mulholland’s career to an end; nominally he remained Chief Engineer of the city’s Bureau of Water Works and Supply until his formal resignation in November 1928, but after the disaster his stature as an engineer was destroyed. However, while Mulholland was no longer active as an engineer after the disaster, his colleagues did not publicly chastise him and most remembrances offered at the time of his death in July 1935 made no mention of St. Francis Dam and its tragic collapse. The issue of Mulholland’s responsibility for the disaster comprised the focus of our 2004 article in California History and it is also central to Heavy Ground. We believe that Mulholland exercised complete control over the St. Francis design and that he took full advantage of the “municipal exemption” provided in California’s 1917 dam safety law that allowed him to build the dam without the review of, or approval by, the State Engineer. As such, Mulholland was given the privilege to design and build the St. Francis Dam as he wished without any outside review or counsel. As we document in Chapter 2 of Heavy Ground, Mulholland’s St. Francis design fell far short of what contemporary engineers of the 1920s were doing in terms of addressing problems posed by the effect of “uplift” acting upon concrete gravity dams. So yes, we hold Mulholland accountable for the disaster and Heavy Ground explains why. What are some of the most poignant or interesting stories you uncovered in the research? Did you find the transcript of the Los Angeles County Coroner’s Inquest (now preserved at the Huntington Library) to be of special value in your work? DCJ: In terms of poignancy, the story of how Lillian Curtis and her son survived the deluge that engulfed the community at San Francisquito Power House No. 2 (located a mere mile and a half below the dam site) is particularly moving. Norris and I recount it in the Prologue to Heavy Ground as a way to highlight the human tragedy brought by the flood—although staying in the same wooden bungalow, Lillian’s husband and her two daughters died that night; a week later they were buried at Forest Lawn Memorial Park in Glendale. The story of William Weinland (an operator at Power House No. 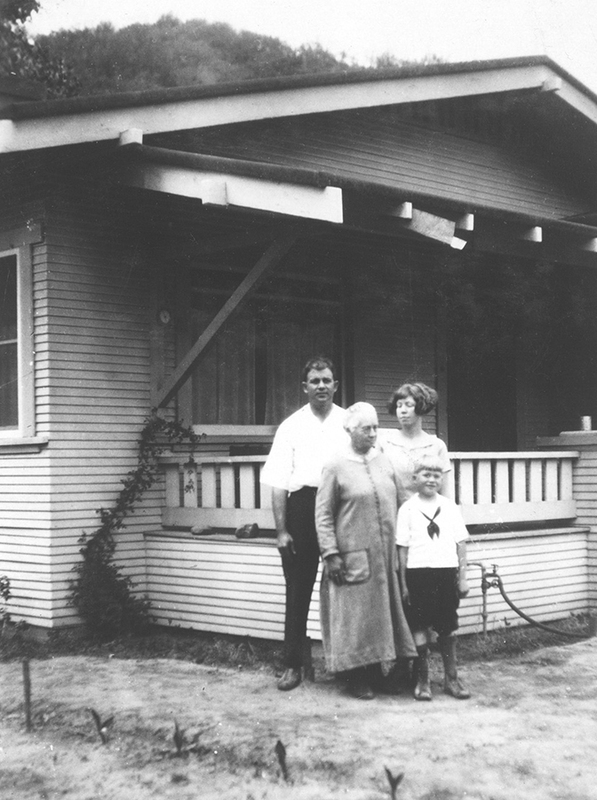 2) and his family is also quite poignant, as his parents came up from Banning, CA a few months before the disaster and took photographs of their son, daughter-in-law and grandson in front of the wooden bungalow that would later be demolished by a 100 foot high wall of water. Unlike the Curtis family, the Weinland family all died in the flood and the next morning William’s body was among the first identified at the makeshift morgue in Newhall. His parents were notified of his death in a telegram sent the afternoon of March 13 and they preserved it in memory of their lost loved ones until donating it to the Huntington Library in the 1940s. Heavy Ground features a copy of this terse missive as a way of highlighting the tragic effect of the flood on far flung extended families. 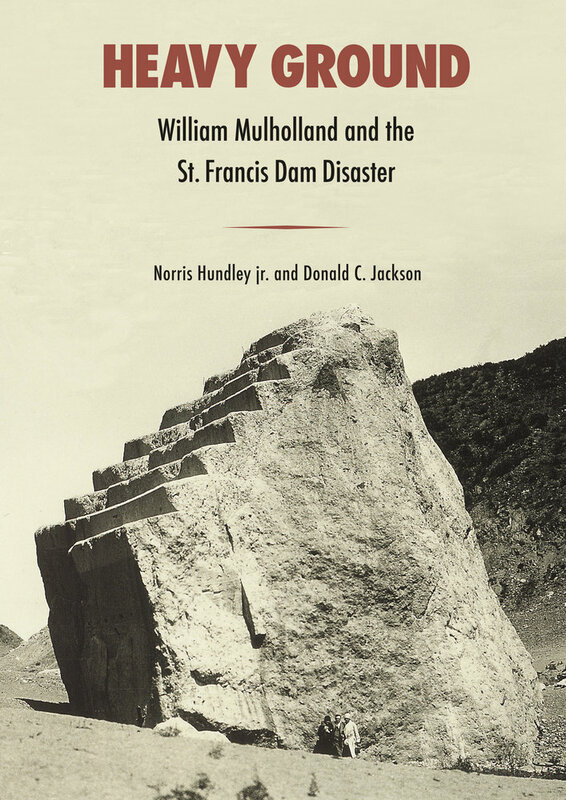 In terms of “interesting stories,” Heavy Ground pays close attention to William Mulholland’s testimony at the Coroner’s Inquest and especially to the context in which he accepts “blame” for the dam failure and then attempts to claim that State Engineer Wilbur McClure approved the St. Francis Dam and its foundation and thus shares some degree of responsibility for the collapse. But the “story” the Mulholland wants to express relating to McClure’s half-day visit to the St. Francis site loses authority when placed in the context of how the State Engineer and his staff reviewed the plans, approved the design, and supervised construction of the Littlerock Creek and Palmdale Irrigation District’s Littlerock Dam (located about 35 miles east of St. Francis) over the six year period 1918-1924. The “story” of the Littlerock Dam’s relationship with the State Engineer’s office (as required by California’s 1917 dam safety law) is one that may appear unrelated to the St. Francis saga, but in fact it provides a telling and significant counterpoint to how Mulholland controlled the construction of his dam in San Francisquito Canyon. Overall, the book makes extensive use of coroner’s inquest testimony, as this verbatim record provides invaluable access to the voices of people who were involved in the design and construction of the dam, experienced the horror of the flood, or witnessed conditions at the disaster site firsthand (both pre- and post-flood). The inquest testimony is certainly not “The Truth” per se and neither is it always insightful or edifying, yet the words stenographically captured by the court reporters allow historians to experience directly how and what questions were posed and answered in the tumultuous days after the disaster. And we can reflect on why some seemingly key questions (such as why the height of the dam was raised ten feet after construction began and how was the original design modified in reaction to this alteration) were never presented to Mulholland or his assistants. In many ways, what was left out of the inquest—and also from the Governor’s Commission investigation of the disaster—becomes a story unto itself within Heavy Ground. The book is marked by the inclusion of extraordinary photographs — can you tell us about the image research you’ve done, and do many of these come from your own collection? DCJ: I have always been drawn to the physical character of water control technologies, and began collecting photographs and antique postcards more than 30 years ago. I used to do my collecting at paper ephemera and postcard shows (along with antique shops and flea markets). But with the advent of eBay and other online auction sites my collecting took on new life and several images featured in Heavy Ground are from original photographs obtained on eBay. I sought to use photographs, maps, and drawings in Heavy Ground not as mere window dressing, but rather as a means of illustrating important issues and concepts. It is one thing to describe how the daughters of Lillian Curtis were victims of the flood, but to see a photograph of them as smiling, happy children helps bring the tragedy to life. And while I can write a description of what a cut-off trench for a concrete dam might look like, showing a picture of such a trench and then contrasting it with a photo of the St. Francis foundation—where clearly no cut-off trench was excavated—makes the point visually. The challenge in assembling the more than 150 photographs used to illustrate Heavy Ground was to insure that each image made its own contribution to the complex mosaic of the disaster. Along with drawing upon my personal collection of dam images (that make up about a third of the images in the book) and the wonderful range of photographs held in the collections of the Huntington Library (that make up another third), I spent much time reviewing photographs held by the Los Angeles Public Library, the Los Angeles Times photograph collection housed at UCLA, and the Los Angeles Department of Water and Power photo archive, all with the goal of assembling a wide range of images documenting the tragedy from a variety of perspectives. And then care was taken to arrange the myriad images so that they connect with, and reinforce, the book’s text. In the end all the effort was well worth it, and I believe that Heavy Ground can engage a wide audience simply because of the way the illustrations have been integrated with the written descriptions and analysis. Did the failure of the St. Francis Dam permanently change the politics of water in Los Angeles and the West? DCJ: Certainly the disaster led directly to enactment of California’s 1929 dam safety law, which eliminated the “municipal exemption” included in the state’s 1917 dam safety law, and this changed how the City of Los Angeles interacted with state authorities in Sacramento. But the political stature of the city (and of the city-dominated Metropolitan Water District of Southern California) remained in place and did not diminish in the 1930s and subsequent decades. The city’s reputation suffered in the aftermath of the disaster, but Los Angeles leaders successfully negotiated contentious issues related to rehabilitation of the Santa Clara Valley and the compensation of victims and their dependents (see Chap. 5 of Heavy Ground). Within a matter of a few years (and in some contexts only months) the disaster disappeared as a subject of public discourse. Viewed broadly, the disaster was never “forgotten” in an absolute sense, but as described in Heavy Ground, supporters of the Boulder Canyon Project Act sought to downplay the significance of the St Francis tragedy so that it would not impede approval of Boulder (later Hoover) Dam. And once the Boulder Canyon Project Act was passed by Congress and signed by President Coolidge in December 1928, there was little reason why BCPA supporters and Los Angeles civic leaders and boosters would encourage memorialization of the disaster. The dam was built for the benefit of the City of Los Angeles, but the affected communities were in the far reaches of northwestern Los Angeles County and Ventura County. Is it possible to say what the total human cost was? And do you think the public memory of the disaster is lessened by the fact that it occurred in the metropolitan hinterlands? DCJ: In the immediate aftermath of the disaster newspapers reported victim totals approaching 1,000, but these proved wildly off the mark. As described in Heavy Ground, the actual number of dead came to around 400, a figure that accords with accountings made in May 1928 and June 1929 and with recent research undertaken by anthropologist Ann Stansell using detailed records held by the Los Angeles Department of Water and Power. It is not uncommon for modern-day newspaper and internet stories to report that there were “600 flood victims” but this number cannot be justified by careful historical research. If topographical conditions had been such that the St. Francis Dam had been built in the upper reaches of the San Fernando Valley near Sylmar and the flood wave had wreaked havoc on slumbering residents in Van Nuys, Reseda and other communities within the City of Los Angeles, then there is no question but that the disaster would be remembered in very different ways, especially by residents of Los Angeles. But because all of the victims were either in a remote part of Los Angeles County or the rural reaches of Ventura County, the disaster remained separated from the direct experience of most Angelenos. City residents contributed to relief funds and were horrified by the tragedy, but the death and destruction remained at a distance. No doubt the long tail of public memory of the disaster among city residents (and the nation as a whole) would have been very different—and likely much more visceral—if the flood had laid waste to the San Fernando Valley and not the Santa Clara Valley. Sad perhaps, but true. In the book you say, “The collapse of the St. Francis Dam was a tragedy with long tentacles, affecting people across the state and nation who had never heard of San Francisquito Canyon or understood its place in the hydraulic infrastructure of Southern California.” Why, then, is this event not better known today? Is there a public commemoration of the disaster? DCJ: In large part, the “long tentacles” of the disaster derived from the fact that the Southern California Edison work crew at Kemp was comprised of young men who were only staying in the Santa Clara Valley for a few weeks. Once finished with building the new Edison transmission line from Saugus to Ventura they would be moving on to other construction projects far removed from the flood plain below the St. Francis Dam. But it was their unlucky fate to be bunked down along the banks of the Santa Clara River on the night of March 12-13, 1928. Eighty four Edison workers housed at Kemp died and their funerals were often held in hometowns far distant from Southern California. The reason that the disaster is not so well known today can be traced to the desire of the City of Los Angeles and its leaders to draw as little attention as possible to the disaster without offending the sensibilities of the aggrieved or raising the ire of people skeptical of the city’s power as an urban leviathan. In addition, civic leaders in Ventura County were content to work quietly with their counterparts in Los Angeles to insure that reparations were paid for deaths and damage to property without recourse to lawyers or the civil court system. In the past few decades residents in and around Santa Clarita (a newly incorporated city which includes the former communities of Saugus and Newhall) have initiated lectures, tours, and other memorial activities to increase recognition of the disaster. The Santa Clarita Valley Historical Society, and its president Alan Pollack, has taken the lead in working to win congressional authorization of a St. Francis Dam Disaster National Historic Site (akin to the National Park Service’s Johnstown Flood Historic Site in Pennsylvania). It is hoped that publication of Heavy Ground will help boost these efforts to increase public awareness of the disaster. Do you think people should visit the site of the dam failure? DCJ: Yes, the site of the dam failure in San Francisquito Canyon is worth visiting, but care should be taken to follow the rules of the Angeles National Forest during any trip to the site. I would also advise anyone to go with a group, preferably led by someone familiar with the terrain and landscape. The City of Los Angeles dynamited the remains of the dam in May 1929 and, although there are many surviving concrete remnants, someone unfamiliar with the site may not readily understand how they relate to the disaster. What do you think the average person living in Southern California should take away from your book? DCJ: Technology does not exist in a political or cultural vacuum. Dams and water control systems are both physical and political constructs and, although the character of the 21st Century regulatory state is different from what existed in the 1920s, engineering design—and its regulation—remains in the realm of human endeavor. No one wants to be imperiled by inadequate or unsafe technologies, but how can we be sure that regulation does not blindly block innovation and creative design? There is no easy answer to this question and I hope that the “average person” in Southern California will look beyond the particulars of the St. Francis disaster and the horrific deaths of some 400 victims to consider how Mulholland’s failings as a dam designer might foster deeper reflection regarding our society’s complicated relationship with technology and public safety. In hindsight, it is always easy to perceive a disaster as something that “regulation” should have protected us from. But regulation is no panacea and it can have a stultifying effect on technological innovation. How would you suggest that this book is a fitting final scholarly contribution by your late co-author, Professor Hundley? DCJ: As the preeminent “Water Historian” of his generation, Norris led the way in elucidating how California came to dominate water resources development in the 20th century American West. Norris perceived William Mulholland as a key player (if not the key player) in rise of Los Angeles as a commanding force in the hydraulic history of the arid Southwest. And he also came to recognize that Mulholland’s responsibility for the St. Francis Dam disaster (the event that brought the self-taught engineer’s career to a close) was, at best, poorly understood. For Norris, Heavy Ground represented an opportunity to bring closure to his historical treatment of Los Angeles—and Mulholland—as actors central to the story of the modern American West. This interview with Donald C. Jackson was conducted through email on November 4, 2015 by ICW Director William Deverell and ICW Administrative Director Taryn Haydostian. Heavy Ground will be available in December 2015 from UC Press. What are the gendered dimensions of international borders? Scholars in the field of borderlands studies gathered at the Huntington Library earlier this month to explore how gender and borders have intersected from the eighteenth century to the present. Panelists included Leisy Abrego (UCLA), Veronica Castillo-Muñoz (UCSB), Miroslava Chavez-Garica (UCSB), Celeste Menchaca (USC), and Andie Reid (Cal Poly SLO). Drawing from their specific research projects while also commenting on the broader field of borderlands history, the panelists addressed innovative approaches to the question of how international borders reshape gender, family dynamics, and sexuality. 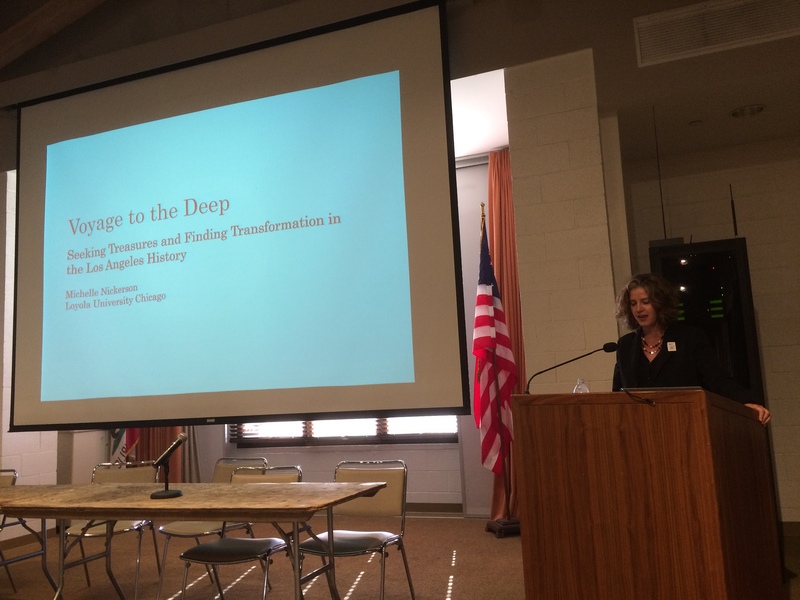 In particular, panelists noted the ways in which this important field is developing, from examining gender and medical borders, to technology and gender in the borderlands, to the ways in which families consciously create trans-border communities. The ICW was particularly excited to host these scholars as it expands programming to include the dynamic field of borderlands history. Please join us as we continue to explore the landscape of the U.S.-Mexico borderlands in the spring of 2016. 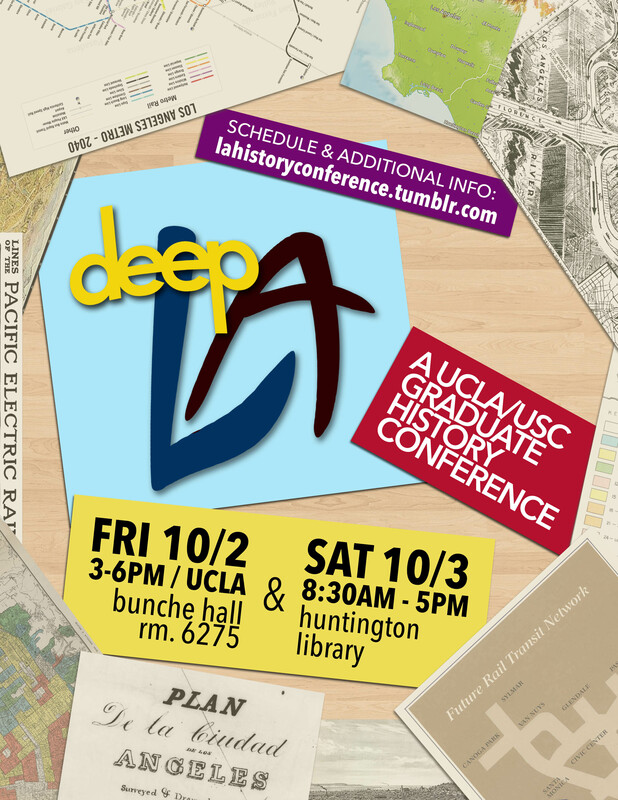 During the first weekend of October 2015, UCLA and the Huntington Library co-hosted a graduate student conference on the history of Los Angeles and Southern California. “Deep L.A.,” as it was titled, was a project over two years in the making, a collaborate effort between graduate scholars at the University of Southern California and the University of California at Los Angeles. Plans for the conference began out of discussions from a joint USC/UCLA graduate history course on Los Angeles, co-taught by William Deverell (Professor of History at USC) and Eric Avila (Professor of History, Chicano Studies, and Urban Planning at UCLA). While initial news of the course had suggested an armistice between students from crosstown rivals, “Studies in Urban History: Los Angeles” was more accurately a reflection of the ongoing, dynamic collaborations between historians at both institutions—which have long coexisted alongside the heated matchups at the Rose Bowl and L.A. Coliseum. Indeed, a cluster of the Ph.D. students who had enrolled in the class was also part of a multi-campus writing group that convened monthly at the Huntington Library. In the summer of 2013, four up-and-coming scholars from this network of historians formalized plans for the conference under the advisorship of Professor Deverell: Daniel Lynch and Max D. Baumgarten, from UCLA’s Department of History; and Celeste Menchaca and Ryan Fukumori, from USC’s interdisciplinary Department of American Studies and Ethnicity. The theme of the conference, “Deep L.A.,” counterbalanced the spatial, temporal, and topical vastness of Los Angeles history, with attention to the intimate textures and microsocial foci that this historiography demands. 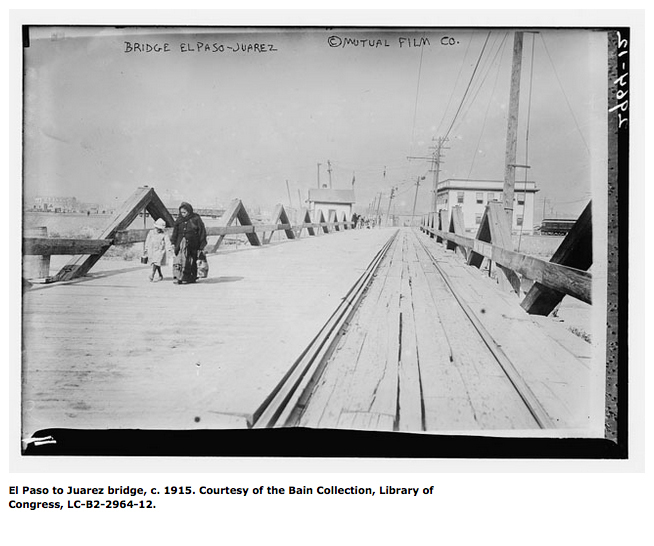 That is, centering on the city and region offered the foundation to explore what constitutes a deep historical practice on Los Angeles and Southern California through a heterogeneity of figures, institutions, neighborhoods, landscapes, and movements. Deep L.A. ultimately convened eighteen graduate historians to share their work, convening scholars from institutions both local (USC, the Claremont Graduate University, and UCs Los Angeles, San Diego, Riverside, Irvine, and Santa Barbara) and far-flung (the University of Virginia). Both days of the conference—October 2 at UCLA, and October 3 at the Huntington—attracted a diverse audience of students, faculty members, and history buffs to listen to the panelists and contribute to the dialogue. Fittingly, the conference participants themselves offered a sprawling portraiture of research into Los Angeles’ historical depths. Attendees heard presentations on the postwar histories of mainframe computing, suburban Christmas lights, community film forums, East L.A. muralists, and LSD usage. Other panelists traced the 20th-century transformation of urban and suburban space in relation to beaches, supermarkets, and freeway traffic. Some participants documented the central roles of women in post-WWII L.A. history, from anonymous runaways and counterculturalists to wealthy philanthropists and civic leaders. Scholars at Deep L.A. also spotlighted some of the historical actors buried in the archives, such as Depression-era citizen surveillance groups and the movie studio employees who themselves conducted historical research at the Huntington in the 1920s. While the majority of presenters opted to focus on the mid-20th century, papers on the pre-1848 networks of Euro-American seafaring traders and Californios, and an 1862 coastal megaflood, offered novel perspectives on the 19th-century history of ecology, commerce, and statecraft in a dense period of conquest, territorial transfer, and settlement. In turn, other presenters explored the deep history of the “shallow” past: symbolizations of the 1992 L.A. uprising in science fiction cinema; unsuccessful secession movements in the San Fernando Valley; Latinidad in the Hub Cities; and contemporary issues around historic preservation in communities of color. The conference culminated in a keynote speech from Professor Michelle Nickerson (Loyola University Chicago), who offered critical insights from her work on 1950s Southern California housewives and grassroots right-wing politics, Mothers of Conservatism. Nickerson dwelled deeply on the process of research and writing itself, ending the conference less on conclusions than poignant questions for further inquiry: what does it mean to relate and sympathize with one’s subjects, when we either agree or disagree with their own politics? How can historians synchronize storytelling with critical analysis? That is—how is a deep historical practice not merely the introduction of new narratives and subjects, but about examining the tools of narration themselves? The array of scholars who endeavor to excavate this storied past, including those who offered their intellect and expertise to this conference, continue to grapple with such matters as they give life to their deep appraisals and analyses of Los Angeles history. As such, “Deep L.A.” was also a challenge to consider the forms of collectivity and collaboration that will animate the future writing of local and regional history. Deep L.A. was made possible through generous support from the Huntington Library, the Huntington-USC Institute on California and the West, the UCLA Department of History, and the USC Department of American Studies and Ethnicity.